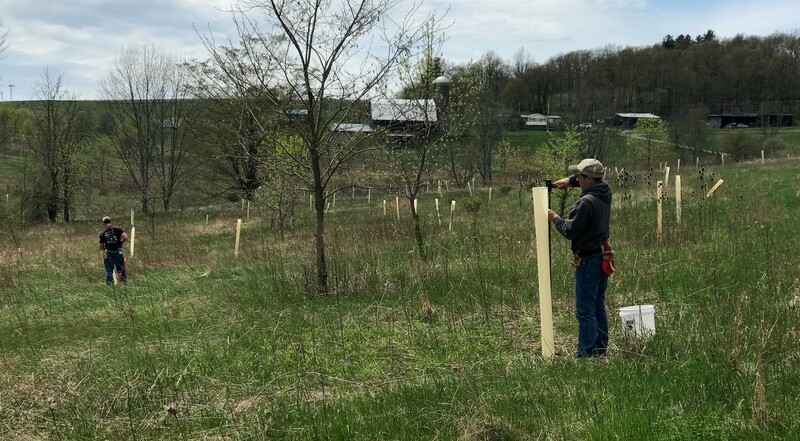 Available this summer is another great opportunity for landowners in Bradford, Sullivan, Tioga, and Wyoming counties to get assistance with maintenance on your riparian forest buffers at no cost to you. The four county conservation districts, with the Chesapeake Bay Foundation and USDA, have come together to offer assistance with maintenance on your riparian forest buffers from two summer interns. Proper maintenance is key to having a successful buffer. This opportunity offers landowners assistance with crucial buffer maintenance such as straightening tubes, replacing zip ties, and removing or re-adjusting bird netting. While assisting you with maintenance, Austin Jelliff and Nick Martin will also do a site assessment to keep you up to date on buffer survival percentage, presence of invasive and noxious weeds, and also provide recommendations as far as further maintenance or replanting trees and shrubs. Furthermore, this is an important educational opportunity for landowners in Bradford, Sullivan, Tioga, and Wyoming counties to work along side these interns to learn more about the proper care and maintenance of their forested riparian buffers. It is preferred that landowners be present to walk through the buffer with the interns. The interns would be glad to assist you. If you or someone you know is interested in this free buffer assistance, please call Austin and Nick at (570) 265-6969 X:3135.